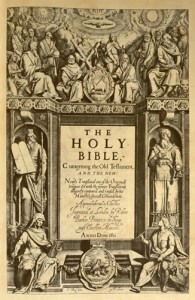 Title page of the 1611 King James Bible. Over the past several months we have been working on scanning, processing, and completing metadata for a very special volume from one of our partners. 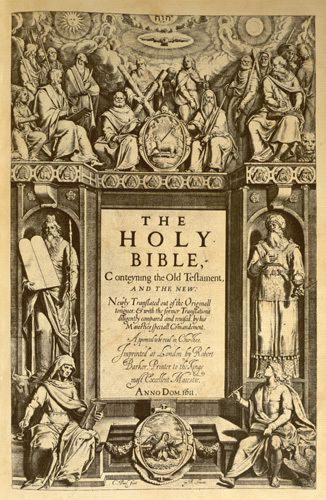 In January, La Salle University brought over their latest batch of items for us to digitize, which included a first edition of the King James Bible from 1611. Not only is this an exciting and important work to digitize, but it is particularly timely now as this version of the Bible celebrates the 400th anniversary of its completion. This book proved challenging to scan in many ways. Its bulky and unwieldy size meant that for most of the process, scanning was a two-person job. The volume is also fairly tightly-bound, which meant that getting the full page was difficult at times. We were able to meet these challenges, however, and we are pleased to present the entire volume online. Seraphin curated an exhibit called “Adornment & Alliance: Preserving Illustrated and Historic Bibles and Curating a Digital Collection Through Constructive Partnership.” This exhibit honors the mission of the Susan Dunleavy Collection of Biblical Literature and highlights La Salle’s partnership with our Digital Library—and, of course, it also celebrates the 400th anniversary of the 1611 King James Bible. The exhibit is on view in the main lobby of La Salle’s Connelly Library until mid-July 2011. One of the great pleasures of working with rare books and manuscripts is getting to “touch” history and make it available to a wider audience online through our Digital Library, though oftentimes these materials may have been forgotten. It has been an interesting and exciting experience to handle and digitize a 1611 King James Bible—a book that still has a tremendous impact 400 years after its original publication. 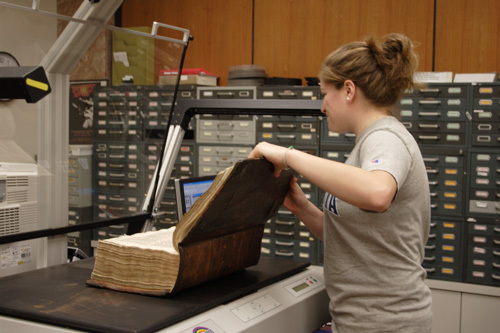 One of our student workers, Celina Wildemann, scanning the King James Bible. Seraphin curated an exhibit to honor the mission of the Susan Dunleavy Collection of Biblical Literature and to highlight La Salle’s partnership with our Digital Library—and, of course, to celebrate the 400th anniversary of the 1611 King James Bible. The exhibit is on view in the main lobby of La Salle’s Connelly Library until mid-July 2011. One of the great pleasures of working with rare books and manuscripts is getting to “touch” history and make it available to a wider audience online through our Digital Library, though oftentimes these materials may have been forgotten. It has been an interesting and exciting experience to handle and digitize the King James Bible—a book that still has a tremendous impact 400 years after its original publication. I couldn’t agree more with you about the importance of this book and must say I envy everyone who had a chance to touch something so valuable and influential. I am regular visitor of your digital library, you are doing great job. Wish you all the best in your further work. I understand how hard it is to digitize that bulky and old Holy Bible. I experienced that in scanning old photos that was captured during WWII. Its hard to scan because of many factors like the quality of paper, stains, lighting when it was captured. A very challenging task but I am glad that you made it and available online. It will help a lot of bible scholars. That looks like an amazing process. At least you can do the scanning with the book face up. Once documents are scanned like that, is there any optical character recognition process performed to convert from picture to words for easier referencing? (laymen here). Bible is a sacred scriptures, it should be taken care of, good thing to know that bible verses can be reached online. I love the <a href="http://www.lds.org/scriptures/bible?lang=eng&quot; Bible. I think it is such a great learning tool that God has allowed us to have. It is so neat that this was able to take place. I would love to know more about the scanning. The people involved are truly blessed.